Manor Park was formed from the grounds of three large suburban houses which stood along Carshalton Road, and a fourth in Manor Park Road. The latter, and largest, was called Manor Park House and gave its name to the park. In 1914, Sutton Urban District Council acquired Manor Park House and its grounds. The park was opened by the Chairman of the Urban District Council on 25th May, 1914. In 1921, the War Memorial Committee was looking for a site for Sutton's memorial and suggested that it was placed in Manor Park, close to Carshalton Road. However, the Council rejected this as they felt that there was not enough space and that it would be necessary to cut down the trees along the road front. The War Memorial Committee then bought the two houses to the east of the park, demolished the buildings and erected the war memorial on the site. The Council agreed to accept the memorial on behalf of the town and 'maintain the ground for the benefit of the inhabitants in perpetuity'. 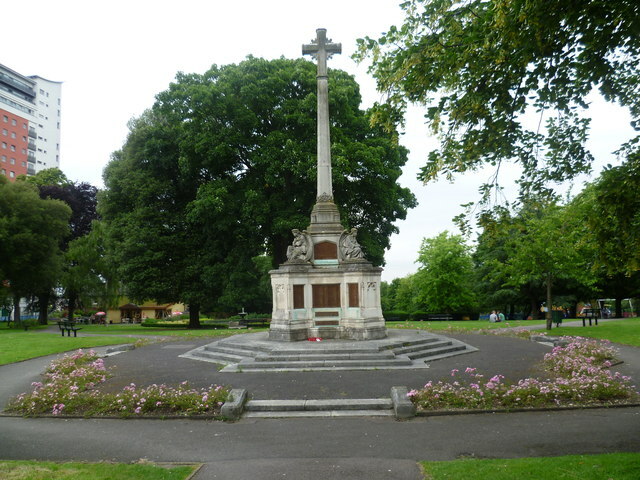 The war memorial is of Portland stone and was unveiled by Sir Ralph Forster at a service in June 1921. Forster was a wealthy local resident who lost his son in the First World War and was a donor to the park and other local causes. The view here is from the Carshalton Road park entrance. This page has been viewed about 457 times.